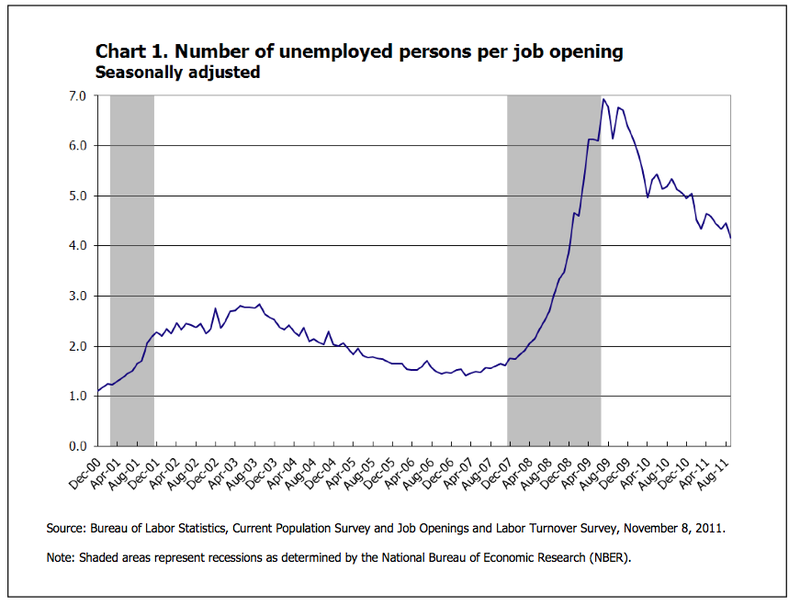 From the BLS, a chart showing the number of unemployed workers per job opening. Unemployed workers per job openings is clearly trending downward, which is good news. But at about 4 unemployed workers per opening, the labor market is still far more difficult than it was at the end of 2007, when the recession started. That’s bad news. The glass is more than half empty. This post is part of “the state of the young college grad” series that I’m doing. Today it’s time for unemployment. In the 12 months ending September 2011, the unemployment rate of young college grads was 4.4%. That’s double what it was four years ago (2.2% in the 12 months ending September 2007). (These figures include everyone aged 25-34 with a bachelor’s degree or more). While the unemployment rate for young college grads doubled, the unemployment rate for everyone else more than doubled. For example, the unemployment rate for young high school grads went from 6.1% to 13.4% over the same period. 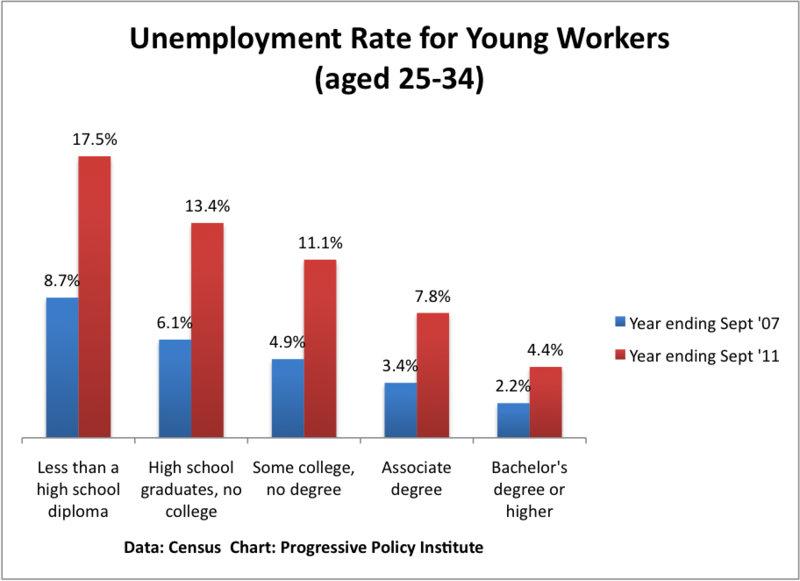 Next I’m going to look at the employment patterns of young college grads. The last thing 32-year-old Mandy Henk expected from volunteering at the Occupy Wall Street library was an invitation to speak at the American Library Association’s 2012 Midwinter Conference in Dallas, Texas. ….Henk, a certified librarian who handles circulation, reserves and interlibrary loans at DePauw University in Greencastle, Ind., joined the movement in late September and rediscovered the role she cares most about — connecting people with information. Up to now, paid employment at performing arts companies has held up pretty well in the downturn. In 2010 the number of jobs at music, theater, dance, and similar groups was only about 6% below the 2007 level, a decent performance considering the depth of the downturn. But in the last few months cuts in funding seem to have finally hit hard. Over the past year, employment at performing arts companies has dropped a sharp 16%, according to today’s figures from the BLS. Performing arts employment is now at the lowest level since 1990. 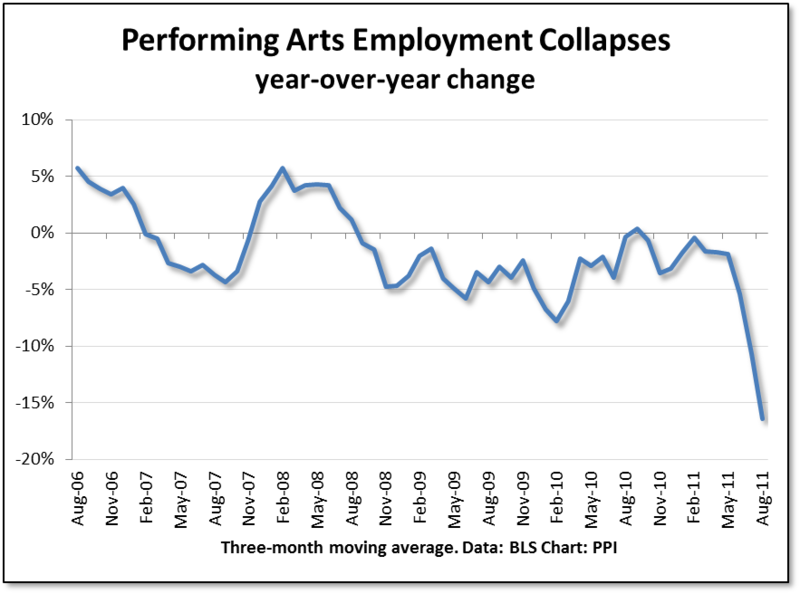 The chart below shows the year over year change in performing arts employment, based on a 3-month moving average. In all likelihood, this will not be the end of the decline, since funding is still being cut.For example, the Alabama State Council on the Arts has cut its grants to state arts groups by 25% for the next fiscal year. For the performing arts, this is the moment where recession turns into depression. These figures are for full-time workers, ages 25-34, with a bachelor’s degree only. See the charts below. I want to ask an economic question, a political question, and a policy question. First, no one has given me a good explanation yet of why young American college grads should have been hit so hard. Is there increased competition with young college grads around the world? Are new college grads lower quality than their predecessors? Has information technology reduced the need for young grads? I really would like to know. Politically, Obama captured the imagination of this group in 2008. Are young college graduates going to sit out the next presidential election in disgust? Is there any candidate that can excite them? Finally, if we were going to design some economic policies to help young college grads, what would they be? 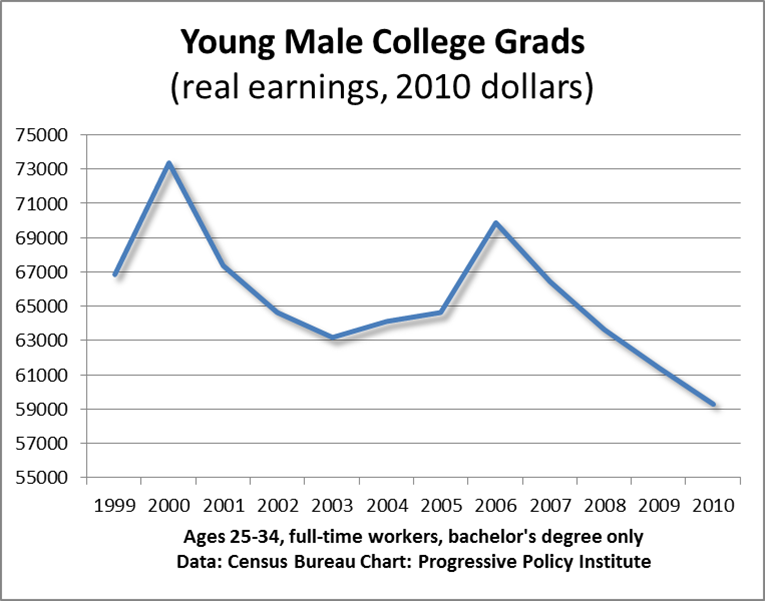 For years I’ve been tracking the decline in the real earnings of college-educated workers. Now, with the latest income statistics, we can see just what the decade of the 2000s has wrought. 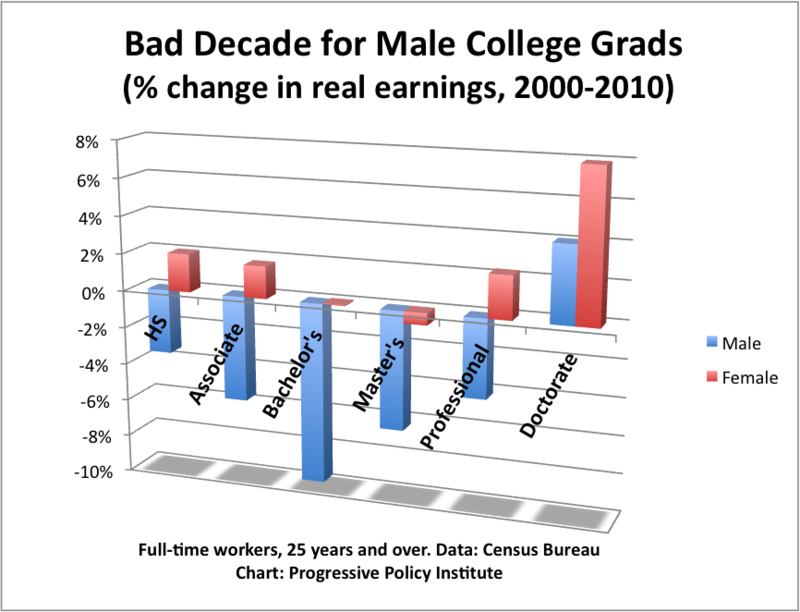 In terms of real earnings, male college graduates were absolutely pounded, taking a 9.7% decline in real pay from 2000-2010 (that’s bachelor’s only). 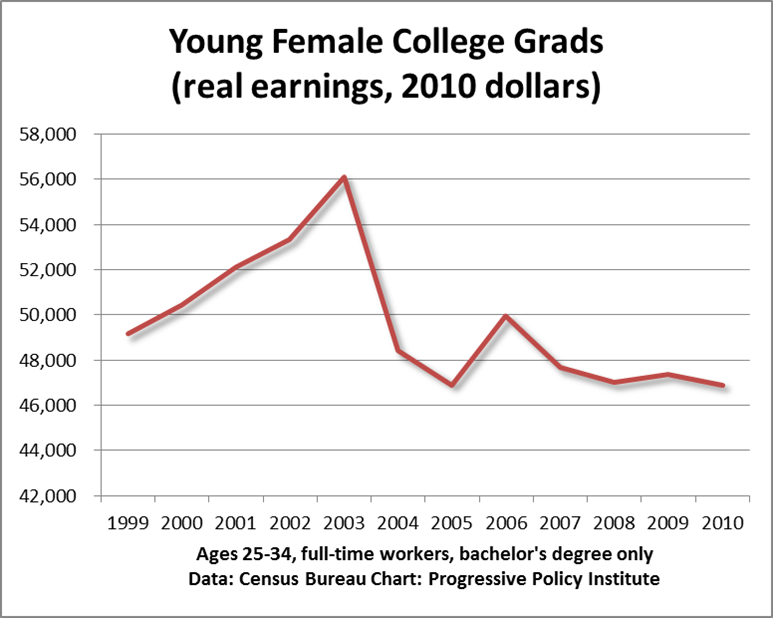 Meanwhile female college grads saw no decline at all in real earnings. (we’re looking here at the real mean earnings of full-time workers 25 years and over). For every educational category, the same pattern holds: Males doing worse than females in terms of change in real earnings. This is not directly related to the sharper job loss for men, since this data covers only full-time workers. However, it does provide corroborating evidence that the labor market seems to have moved against male-dominated industries and occupations, affecting the college educated as well as workers with only high school diplomas. This is obviously not universal, given the high demand for computer and tech jobs, which tend to be male dominated. For example, 80% of computer software engineers are male. which should be a plus for male wages. But the ‘tech effect’ seems to be overpowered by the ‘health-education-effect’, since health and education occupations, which have done well over the past decade, are for the most part are disproportionately female.